Guards at eight correctional centres were off the job on Saturday afternoon in what has been ruled an illegal strke. The union representing correctional officers at the Edmonton Remand Centre call on the province to hold off on transferring inmates to the new facility until safety concerns are resolved. Alberta Union of Provincial Employees (AUPE) announces it has a list of problems five pages long that it cannot make public due to security reasons. However, Justice Minister Jonathan Denis says the transfer will go ahead. Transfer to the new remand centre in north Edmonton from the old facility in downtown Edmonton begins. Defence lawyer Darin Sprake says he was able to walk into the Edmonton Remand Centre through the staff entrance last week. He says guards couldn’t find his client due to computer problems and had problems operating screening equipment. Provincial officials say Sprake still would have had to have passed through more security to arrive where the prisoners are kept. 3:00 p.m. Guards working the afternoon shift at the remand centre refuse to report for duty when two union representatives are suspended after objecting to working conditions. Guards from the morning shift are placed on overtime. 6:30 p.m. Dan Laville, spokesman for Alberta's solicitor general, calls the walkout an "illegal job action." 7:00 p.m. Morning shift guards are relieved from duty by RCMP officers and prison managers. 10:45 p.m. CBC learns guards at Fort Saskatchewan Correctional Facility have walked out in solidarity. 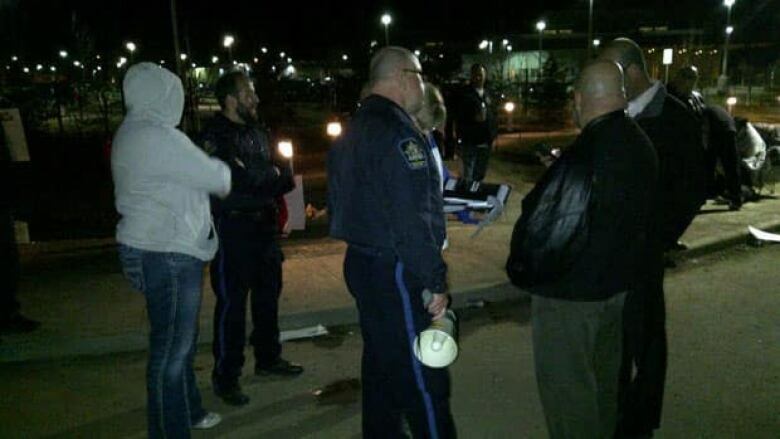 11:10 p.m. A source informs CBC News that members of the RCMP riot squad were being sent to the remand centre. 11:45 p.m.. CBC videographer Gary Moore confirms the riot squad is inside the facility, which is being described as "chaotic and dangerous." 12:15 a.m. Alberta Justice Minister and Solicitor General Jonathan Denis releases a statement calling the walkout an illegal job action. "As a result, the Department of Justice and Solicitor General is filing an injunction tonight to ensure guards are back at work soon," the statement reads. "Any threats to public safety are dealt with swiftly and seriously by this government. We will investigate this fully." By Saturday morning, the job action has spread to five other correctional centres in Alberta. 9:00 a.m.. Alberta Labour Board hears arguments on the legality of the walkout by members of the Alberta Union of Provincial Employees at the Edmonton Remand Centre and Fort Saskatchewan Correctional Centre. All other provincial centres must be served with four hours' notice before a hearing can be held to force those guards back to work. 11:00 a.m. AUPE vice-president Carrie-Lynn Rusznak says if workers are ordered back without concessions on the part of the province regarding safety issues it will be up to workers to decide whether to return. In either case, she says, the union will back them. 1:25 p.m. Labour board rules the strikes illegal at the Edmonton Remand Centre and the Fort Saskatchewan Correctional Centre and orders the guards back to work. AUPE president Guy Smith tells remand centre guards the board ordered them back to work and that they are taking part in an illegal strike. But he encourages them to stay off the job, which the CBC's Janice Johnston reported was met by wild applause and cheering. Workers at the Red Deer Remand Centre walk off the job, meaning eight Alberta corrections facilities are affected by the wildcat strike. 4:30 p.m. Deputy Premier Thomas Lukaszuk and Justice Minister Jonathan Denis hold a news conference at the Alberta legislature. Lukaszuk says that Smith presented him with a list of 10 demands. But Lukaszuk says there will be no discussions until the guards return to work. "We will not be negotiating with a union that chooses to engage in illegal activities," he said. 6:30 p.m. CBC’s Scott Stevenson spoke with Robin Southcombe, an inmate at the Fort Saskatchewan Correctional Centre. Southcombe described the situation on the women’s side as tense, but added that things seemed much worse on the men’s side. "They had to pull out a lot of men on the units because... they're trying to start riots on each unit but the women are doing okay. We have one RCMP and some other lady here who's in white but I don't know, we've never seen them before." "Right now I feel, really, it's like on eggshells right now, it's very on edge." 10:10 p.m. CBC learns that guards at the Red Deer Remand Centre, Medicine Hat Remand Centre and Calgary Young Offender Centre had also walked out, bringing the total of provincial institutions on lockdown to 10. 1:30 a.m. Thirteen guards at the Edmonton Remand Centre were served with court documents ordering them back to work. 11:00 a.m. Union leaders met with Alberta sheriffs at the AUPE headquarters. A union member told CBC’s Briar Stewart that the AUPE will ask the sheriffs to join in on the strike action. 12:45 p.m. An AUPE representative announced that corrections workers at remand centres in Red Deer and Medicine Hat have decided to return to work. 1:15 p.m. Calgary and Edmonton sheriffs announced they plan to join striking corrections workers tomorrow. 2:30 p.m. Alberta Justice released a statement to the province's corrections workers. In it, the province says that the situation appears to be resolving. "Some of you have returned to work, and others have said they would like to return to work but feel intimidated. We are aware of these union pressure tactics, which include misinformation being distributed," reads the statement. "We can report, however, that picketing activities have substantially declined throughout the province." Meanwhile, corrections workers from Saskatchewan have joined the picketers outside the Edmonton Remand Centre. CBC's Terry Reith is reporting that some Edmonton sheriffs are also on site to support the striking corrections workers. 4:45 p.m. Edmonton probation officers voted almost unanimously to strike in solidarity with Alberta's corrections workers. They will not report to work on Monday. 7 a.m. Sheriffs set up pickets at Edmonton and Calgary court houses. 4 p.m. A hearing to find striking workers in contempt of court starts in Edmonton Court of Queen's Bench. 10:30 p.m. Associate Chief Justice John Rooke rules that AUPE is in contempt of court. The union is fined $100,000. If the strike isn't over by noon on Tuesday, AUPE will be fined another $250,000. If workers are still off the job by noon on Wednesday, the fine rises to $500,000 and goes up by that amount each day the strike continues. The Alberta Labour Relations Board also issues a decision ordering all striking employees back to work.